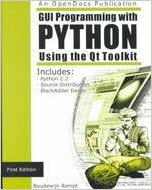 The main topic of this book is application development using PyQt, a library extension to the Python programming language that is meant to form the basis for GUI programming. Part I and II of this book concern themselves with concepts: here the examples are small, often amounting to less than one page of code. Part III takes you through the development of a complete, complex application. In this case an editor, but one with a lot of extra features. This book is intended for anyone, from beginning software developers to experienced programmers. Whether you're building GUI prototypes or full-fledged cross-platform GUI applications with native look-and-feel, PyQt is your fastest, easiest, most powerful solution. Qt expert Boudewijn Rempt has written the definitive best-practice guide to PyQt development. You'll learn how to build efficient GUI applications that run on all major operating systems, including Windows, Mac OS X, Linux, and many versions of Unix, using the same source code for all of them. It systematically introduces every core GUI development technique: from dialogs and windows to data handling; from events to printing; and more.